At the beginning of practice at the Autodromo Enzo & Dino Ferrari it was clear that, unless the McLarens broke down, Ferrari was not going to win. David Coulthard was nearly half a second ahead of Mika Hakkinen, who had been forced to lift off on his fastest lap when Giancarlo Fisichella spun his Benetton. The Ferraris shared the second row with Schumacher ahead of Eddie Irvine while Alexander Wurz did a good job for Benetton putting his car ahead of Jacques Villeneuve's Williams on row three. At the start of the race the two McLarens got off the line well as usual and Coulthard duly took the lead from Hakkinen. Schumacher was third but found himself under attack from a fast-starting and aggressive-looking Villeneuve. Wurz's promising qualifying was ruined within seconds as he suffered a gearbox problem as he accelerated away from the grid and he was then rammed from behind by Damon Hill's Jordan. This created problems behind them and the Stewart team demolished itself as Jan Magnussen ran into the back of Rubens Barrichello. 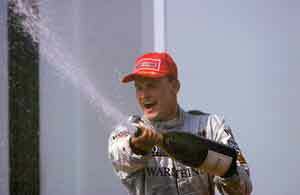 Coulthard began to build up an advantage and it was quickly clear that Hakkinen could not match him. After 17 laps the Finn retired with a gearbox problem, leaving Coulthard a very long way clear of Schumacher's Ferrari. Coulthard, Schumacher and third-placed Villeneuve all pitted at the same time but Eddie Irvine stayed out for an extra lap and was able to get ahead of Villeneuve when he stopped. Jean Alesi also did well to move into fifth ahead of Heinz-Harald Frentzen. The order remained unchanged at the second pit stops and Coulthard was able to build up a 20 second lead over Schumacher, with Irvine half a minute behind him. Villeneuve and Frentzen finished fourth and fifth for Williams, while Alesi finished sixth in the Sauber Petronas.